A Votre Service! 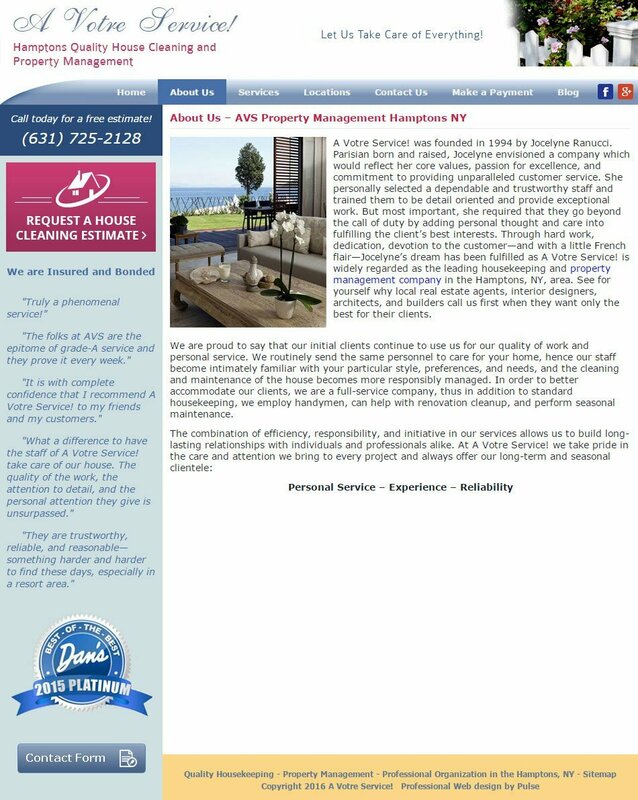 Is a Hamptons house cleaning service company that was established in 1994. All their staff members are personally hand-picked by the founder herself, Jocelyne Ranucci. They are the cream of the crop when it comes to providing exceptional customer service. Their eye for even the tiniest details is evident in the fact that A Votre Service is the top choice for housekeeping services in the Hamptons, New York. A complete list of A Votre Service! offerings from house cleaning to house watching and handyman services. Blogging to keep clients engaged and attract more visitors to the site. After discussing all of the above requirements with the customer, the Pulse Solutions team designed a WordPress team for A Votre Service. The site turned out to be easily navigable even on mobile devices. Complete website design that is aesthetically pleasing and user-friendly. A blog was added to feature relevant content that increases website visitors and improves visitor engagement. 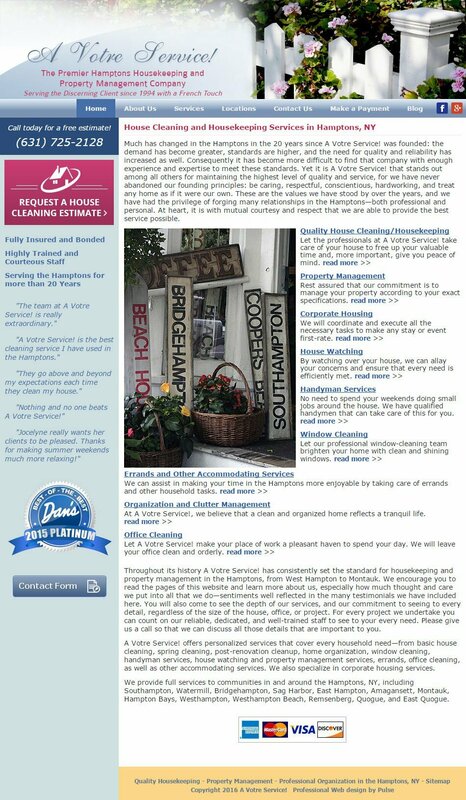 Each service was provided a dedicated page that discusses specific offers from the company. The site’s overall look is sophisticated with a light color scheme. The site has an easy navigation that makes it easy for customers to contact the company, make payments, view locations, and company services. SEO-friendly features were added to attract more visitors to the website. The new website for A Votre Service! developed by the Pulse Solutions team brought positive results to the client’s business. Customers are able to pay their dues conveniently on the website via credit cards. The addition of SEO techniques brought the A Votre Service! 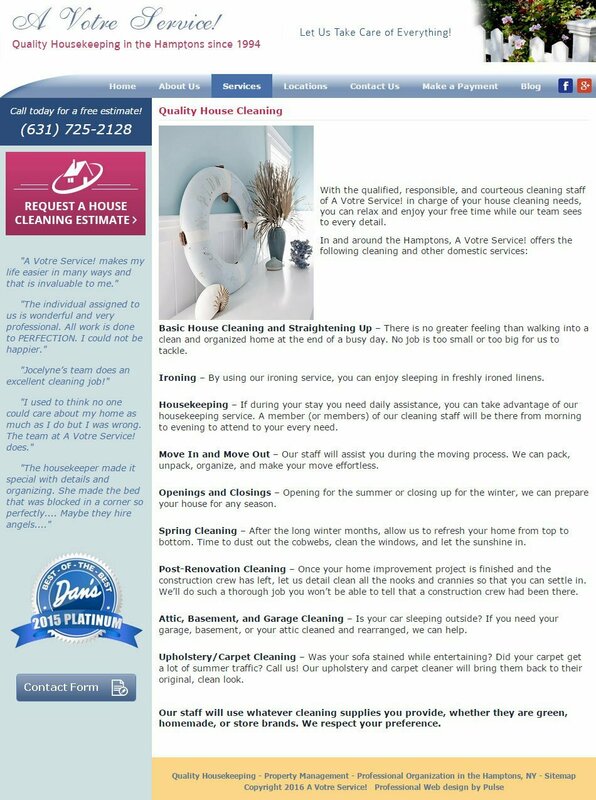 website to the first page of Google in the Hamptons house cleaning service category. The website is easily navigable, making it easy for visitors to find what they are looking for. If you are looking for a team of web design experts to work on your website, look no further! Pulse Solutions is recognized as one of the best and the brightest in the web development industry. Carrying several professional web development solutions, Pulse is your partner in creating the best online experience for your clients. Contact us today!